Whatever fanbase controversy there may be among the purists over Guy Ritchie’s Sherlock Holmes, it will surely be drowned out by the applause of the general audience and of the more open-minded Holmes readership. Easily one of the most enjoyable action pictures in recent memory, this alternately brisk and brainy reworking of the legendary detective’s mythos makes the delightful Robert Downey Jr. into a rumpled, complicated and alternately swashbuckling and pratfalling Holmes for our time. Call him Indiana Holmes if you must, wring your hands over his dissipated and vaguely Byronic demeanor if you will. The fact remains: under Ritchie’s expert guidance, Downey has at last found a big, iconic mainstream movie character that draws on the full range of his limitless acting capacity, not just his brash narcissism, the way Iron Man’s Tony Stark does. If this film does anything like the business it deserves, Downey might even replace the revered but antiquated Basil Rathbone Holmes in the cinematic pantheon as the image that appears in most moviegoing brains whenever the words “The game’s afoot!” are recited. Sherlock Holmes sets Downey’s detective and Jude Law’s equally robust Dr. Watson against Lord Blackwood (played with unexpected subtlety by Ritchie regular Mark Strong), a villain comprised of fifty percent Aleister Crowley, thirty percent Count Dracula and twenty percent Adolph Hitler. Having opted to make an adventure movie rather than a whodunnit, Ritchie and his writers are savvy enough to begin at the end of the previous unit of action, with Holmes heroically solving a mystery and revealing the identity of a ritualistic serial killer, thereby setting up the plot proper in the grand and classic Holmesian style. Blackwood is an occultist dedicated to taking over a quasi-Masonic secret society and using it as a springboard for establishing a fascist regime in Britain. Holmes is of course bent on stopping him, and though his relationship with Watson is somewhat fractured by the good doctor’s impending marriage to Mary Morstan (Watson’s actual paramour from the Arthur Conan Doyle novel The Sign of the Four), Watson is reluctantly dragged along for the ride. Along the way, the two men have alternately harrowing and droll run-ins with several of Conan Doyle’s more memorable creations, including Professor Moriarty (a faceless and shadowy figure here, likely because he will be played in the next film by an actor yet to be cast), Inspector Lestrade (a note perfect Eddie Marsan) and Irene Adler (Rachel McAdams), the sympathetic American villainess of the very first Holmes short story and one of the only adversaries ever to outsmart him. Adler, a wronged woman seeking justice in Conan Doyle, has been re-invented as a dangerous adventuress, and Holmes’ ambivalent fascination with her in the books is recast as the sort of bad love that will be familiar to fans of Batman and Catwoman, all heartsick yearning across the line that separates evil and good. McAdams is a fetching and decorative actress who has to work hard to keep up with her quicksilver costars, but every time Downey looks at her, he magnifies her performance by summoning an ineffable and unburied grief. It’s the Holmes and Watson rapport that defines this movie though, just as it did the Conan Doyle stories, and reinvented though the characters are their relationship works beautifully. Shorn of his familiar stage and screen trappings (the deerstalker cap Conan Doyle never put on Holmes’ head, the meerschaum pipe awarded Holmes by his great 19th and early 20th century stage interpreter William Gillete), Downey’s Holmes is frothy and even comedic, but still emphasizes the dark side of Conan Doyle’s creation. His agile brain lacerates him when there’s no case to occupy it, and he soothes the pain with alcohol, vitriol, masochistic boxing matches and the contents of Watson’s handy medicine bag. Law’s Watson is the perfect counterpoise—a man brilliant, but less so, and therefore the anchor and the sounding board Holmes desperately needs. As brave as Holmes and nearly as discerning, Law seems to have stepped out of one of Sidney Paget’s illustrations for the Conan Doyle stories from their original run in The Strand Magazine. His vivid portrait will hopefully replace the famed Nigel Bruce interpretation in the Rathbone film series that mischaracterized Watson as a blithering buffoon. The platonic love between these two characters is something we rarely see on movie screens. Even rarer is a hero, like Holmes, who is celebrated unapologetically for his recognizably human exceptionalism. Bruce Willis in his sooty t-shirt, Jackie Chan, whose physical brilliance is married to a naïf, the lumpen blue-collar musculature of Vin Diesel and The Rock—these are the everyman heroes that have for so long haunted our screens. With his barely suppressed sneer and the hot flash of his lacerating intellect, Holmes is of another breed entirely. 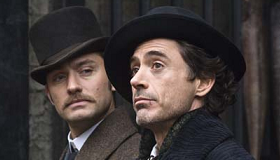 In Ritchie’s capable hands, Downey’s Holmes reminds us with nearly every gesture that he is better than we are—an alternate model for what a human being can be. What a utopian believer in human potential Conan Doyle must have been, to create such a character. And how fortunate we are that Ritchie and company have revived him for you and me. Rating: PG-13 for intense sequences of action and violence, some startling images and a scene of suggestive material.